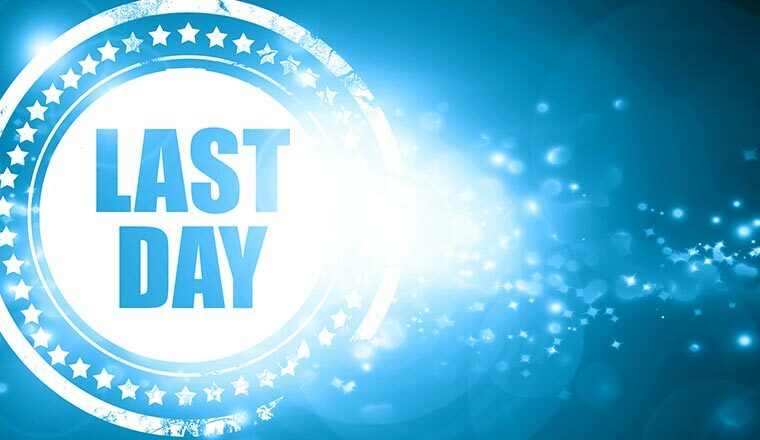 Voting now Closed in Our Technology Awards 2018! Voting is now closed in our “Top 10 Contact Centre Technology” awards. Follow the link to find out the results! We have listed all of the nominated companies and their products below, together with brief details about each product to help you choose. You cannot vote if you are an employee or a distributor or an investor or have any other financial interest in the product. You can alert your customer base. All invalid votes will be discounted. Please make sure as well as clicking the logo you fill in your details to confirm your vote. Voting closes on today – Friday 6th April. The winning product will be announced in late May 2018. Brief overview of product: 8×8 Cloud Contact Centre offers an agile contact centre solution suite that combines not just world-class contact centre capabilities, but also delivers workforce optimisation, quality management, advanced business phone and collaboration services and unified communications. 8×8’s Cloud Contact Centre solution enables organisations to easily and cost-effectively manage geographically dispersed agents. It helps organisations deliver amazing customer experiences at every touch point by giving agents unified visibility into all communication channels, real-time access to communications and customer data, analytics and subject matter experts. Additionally it offers business continuity and customer service resiliency across headquarters, remote offices and outsourced locations, requiring only a phone, internet connection and web browser to get started. Organisations of all sizes–from small businesses to large enterprises–use 8×8. 8×8’s solution supports most popular interaction mediums: voicemail, email, web callback, web chat and more, all accessible from an interface that is entirely browser-based. Furthermore, as well as providing its own CRM solution, it integrates directly with several leading CRMs and can be configured to interface with other enterprise applications to ensure that their customers are delivering more rewarding experiences with every customer engagement. 8×8 Cloud Contact Centre Quality Management enables contact centres to measure and improve agent performance to elevate the overall customer experience. Quality Management allows organisations to identify and monitor agents in need of coaching and highlight high-performing agents as role models. The easy-to-use, cloud-based system delivers the breadth and functionality required to deliver excellent customer experiences and maximise agent efficiency. Quality Management provides powerful search tools and a comprehensive agent review environment to provide real-time feedback on agent-customer interactions. The product enables managers to quickly and efficiently search through thousands of calls in seconds and filter transactions on a variety of criteria. Screen and voice monitoring to track events in real time. Flexible scorecards to structure and rationalise feedback for agents. 8×8 offers workforce optimisation capabilities to improve resource allocation using forecasting based on historical call patterns to ensure that customer satisfaction is being met regardless of contact volume. 8×8 cloud contact centre additionally provides groundbreaking Customer Experience analytical tool providing unprecedented levels of visibility into customer interactions and IVR usage. What are the Unique Selling Points of the product? 8×8 offers a much simpler, more efficient alternative to patchwork solutions. With 8×8, organisations get everything they need in one place, all owned, developed and supported by our own engineers . The solution suite combines not only world-class contact centre capabilities, but also workforce optimisation, advanced business phone and collaboration services and unified communications. Additionally, because 8×8 unites geographically dispersed agents, it helps organisations achieve business continuity and customer service resiliency in the event of a network outage, natural disaster or some other unforeseen event. Companies that have dispersed operations–remote call centres and/or home-based agents spread throughout a region, country or even globally–benefit most from the virtual call centre environment. Typical customers: There is no typical customer at 8×8 , our broad choice of licence types enables the start up working from their spare room or the large organisation with demanding integration requirements to all effortlessly adopt the 8×8 solutions. Brief overview of product: Bright Navigator provides companies with the ability to capture VOC feedback at all parts of the customer journey which is used to drive operational performance, improve service levels/satisfaction metrics (NPS, CSAT, CES) and helps engage the frontline workforce. It measures continuously; providing real time insight into what customers think and why. 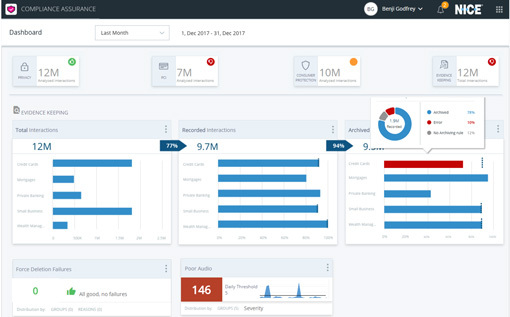 Bright Navigator introduces industry first technology allowing clients to find links between three areas: Customer feedback, Employee Engagement and internal performance metrics giving a unique holistic view of their business areas. The tool can be deployed to collect both transactional and relationship surveys measuring the end to end customer experience. Not only is the tool quick to deploy it also comes with inbuilt technology allowing clients to no longer guess how metrics affect each other. Using the correlation tool embedded in the software, companies can find (often counter intuitive) links between e.g. service levels and customer satisfaction, productivity metrics and employee satisfaction, employee engagement and conversion rates. Bright Navigator provides a user-friendly interface for both management and team members allowing them real-time access to customer feedback. In addition, clients have a senior consultant dedicated to their account providing quarterly workshops analysising the collected data and offering an outside lens to the findings along with experience of working with numerous brands across the UK. Instant customer feedback – Customers are surveyed seconds after the interaction. The results are fed back both to frontline operatives (creating a self-developing solution) and other departments (decreasing complaints and detractors). Alerts and action management – Enables the contact centre to become a true real time information hub by proactively sharing insight on broken processes, customer dissatisfaction and sales/marketing opportunities. Text Analytics – Our text analytics dashboard shows you at a glance what your customers are talking about without the need for manual data mining. It takes moments to create word or phrase clouds and filter these by score to identify key ‘promoter’ or ‘detractor’ topics. Reporting – Ensuring stakeholders and senior management are kept informed of how your customers are feeling is essential when driving customer satisfaction. Our Reporting Module can help you to do this and to ensure you continue to work to a common goal. Coaching Tool – Allowing managers to utilise performance, Voice of Customer and Voice of Employee data to better inform training needs and engage front line teams. Typical customers: TUI, Coop Insurance, Addison Lee, Which, The White Company, Domestic & General, Medway Council, Genesis Housing, Shop Direct, South West Water. Brief overview of product: CallMiner, the industry pioneer and innovator in interaction analytics proudly submits the latest iteration of its award-winning post contact interaction analytics system, CallMiner Eureka 10. 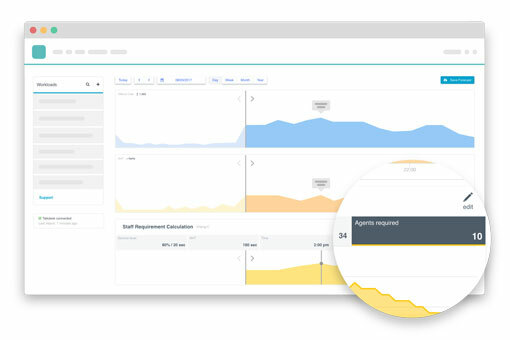 This true, multichannel customer journey contact analytics platform, offered as a fully hosted or premise SaaS system improves contact centre and enterprise performance through revealing insights from automated analysis and scoring of 100% of communications across multiple channels – including calls, chat, email, texts, social media, surveys and more. Combining its “Best in Class” Speech to Text recognition engine and powerful customer journey mapping and analysis tools, this enabling technology drives keen VOC and agent actionable insights to customer engagement organisations, helping them to improve agent coaching and performance, drive great CX, lower operating costs and improve business outcomes. CallMiner’s highly versatile, customisable and scalable technology is based on an open systems architecture and thru the power of its robust ingestion and export API capabilities is integrate-able with virtually any IVR, recorder, telephony, WFO or text based technologies. Among the many analytics industry firsts for CallMiner Eureka is “myEureka”, a dynamic, individual persona web-based performance feedback portal providing direct, near real-time agent scoring metrics and KPI’s to virtually all levels of the agent community including the agents themselves. 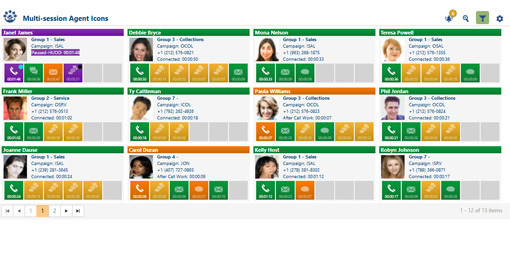 myEureka, coupled with the highly customizable Eureka individual dashboard display means all constituencies within your contact centre organization get the right information at the right time to drive optimal contact outcomes for your business. 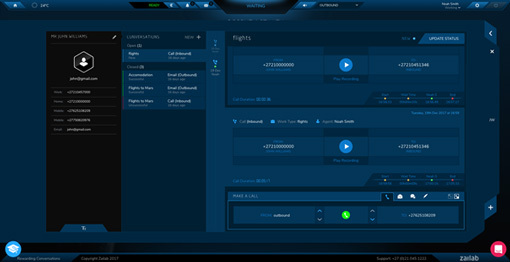 Unlike virtually every other “player” in the interaction analytics space, CallMiner’s administrative, configuration, category and score card building, discovery and calibration tools are designed to be intuitive and user friendly with the intent of making customers more self-sufficient and less reliant on professional services to drive their own analytics success. Add the incredible Eureka Xchange web based, pre-built category download platform to the mix and customers once again experience incredible cost and time efficiencies over having to build their analytics platform from scratch. What are the Unique Selling Points of the product? CallMiner’s unlike other analytics vendors. Converts customer interactions (calls, chats, emails, surveys, social) into a format for analysis. 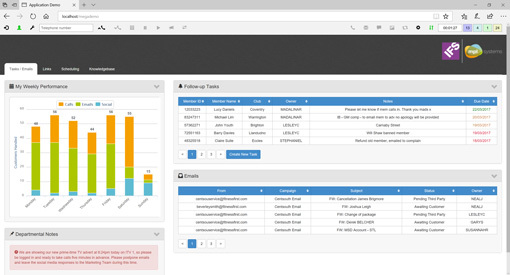 Captures metadata from any source (call recorders, chat systems) and across multiple contact center sites and locations. Automatically evaluates every contact for sentiment/acoustics, categorization, and performance scoring. Allows for free form search to find and playback contacts containing certain words and phrases or sharing other characteristics in a familiar web search user experience. 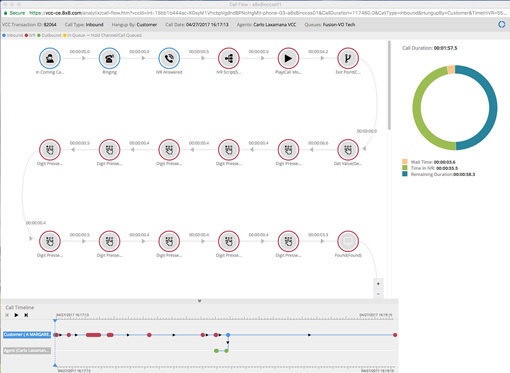 Allows for evaluation and comparison of performance and key metrics using data visualization. Determines Root cause through auto topic analysis and automatically identifying outliers. Allows viewing and measuring key performance indicators across the entire omni-channel customer journey through intuitive visualization. Provides powerful Application Programming Interface (API) with Software Development Kit (SDK) to enable easy extract of interaction analytics data and greater speed in developing customer workflows. Enables manual tagging, commenting and score adjustments to enhance automated quality monitoring and agent coaching workflows. Approx. number of UK customers using the product: 20 with an approximate total of 15,000 agent seats. Brief overview of product: Acting on customer feedback is the most cost-effective investment a contact centre can make in improving customer loyalty. CustomerSure is the easiest way to set up a working customer feedback process. The cloud platform makes it quick to set up simple surveys, connect to your existing IT systems so surveys are sent at appropriate times, and – most importantly – easy to follow up on the feedback you receive, so customers aren’t disappointed . Alongside this simple-yet-transformational feedback loop, CustomerSure provides powerful reporting tools – report on your preferred satisfaction metric, NPS or CSAT, segment scores by individuals or business units, perform text analysis to spot trends, and detailed response rate reporting so you know your surveys are making it through. What are the Unique Selling Points of the product? Software implementation is often harder than it needs to be or fails completely because of poor vendor support. CustomerSure aims to deliver the opposite – we generously provide as much expert support as is needed to ensure that our customers see success when they choose us. Making feedback work takes more than a software purchase – it takes systems and training. Our consultants, all of whom have an industry background, work with every one of our customers to help set up these systems. And our technical team aim to surprise every person who requests support by delivering a fast response that not only fixes their problem, but understands their business needs. Approx. number of UK customers using the product: Approx 50, with team sizes ranging from 10-300. 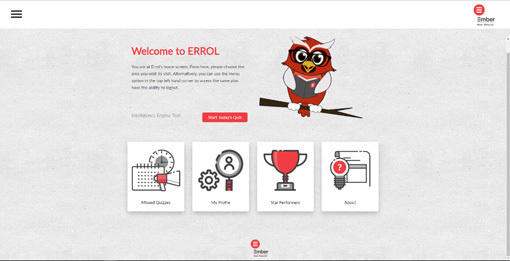 Brief overview of product: ERROL is a new user friendly interactive learning tool which supports the embedding of learning solutions and the identification of potential knowledge gaps using artificial intelligence. ERROL gives organisations the opportunity to decide, how many questions their learners get and how often they get them. ERROL gives the you real time tangible data to gain a clear insight into the learner’s knowledge retention. ERROL uses artificial intelligence to vary the questions the learners get against their success rate at answering them, so if they find a certain set of questions easy it will give them more challenging ones. The great thing about ERROL is you can also embed sound bites, pictures and videos in the tool so you can really test their knowledge retention. Typical price for a 100 agent solution: ERROL operates on a per user licence. If an organisation took ERROL for 100 the cost would be £12,000 + VAT per year. The Genesys Customer Experience platform combines orchestration and journey management to provide omni-channel contact centre best practices for great customer experience with compelling business outcomes. It integrates channels, context and the ability to optimise an organisation’s workforce and processes. With an Omni-channel Customer Experience Centre solution, a company can deliver consistent and hyper-personalized customer experiences across all channels, touchpoints and journeys. Launched globally in 2015, PureCloud is a unified, all-in-one customer engagement and business communications solution that is easy to use and quick to deploy. A true cloud offering based on microservices architecture, PureCloud is flexible, open, feature-rich, and built for rapid innovation, providing organisations with a future-proof solution for quickly scaling to meet customer growth. PureConnect is a proven, all-in-one omni-channel engagement offering that is rapid to deploy, simple to administer, flexible and easily tailored to meet specific needs within the commercial and mid-market segments. Available both on-premises and in the cloud, PureConnect can help customers make the transition to the cloud with a seamless process that uses the same software for familiarity and ease. This offers organisations the option to move, blend and grow as they need. PureEngage is a true omni-channel customer engagement suite for global businesses to deliver competitively superior experiences — providing real-time contextual journeys, world-class orchestrated routing, and digital transformation at any scale. What are the Unique Selling Points of the product? Genesys has been a leader in the contact centre market for nearly thirty years. In 2017, multiple top third-party analysts recognized Genesys for our industry-leading contact centre and customer experience solutions. The Ovum Decision Matrix: Selecting a Multichannel Cloud Contact Centre Solution. The value we provide our more than 10,000 customers worldwide is evident across organisations and industries of all types and sizes. We are proven in diverse industries including banking, insurance, telecommunications, finance, retail, government, travel and hospitality. We offer on-premises and cloud solutions for businesses of all sizes and sophistication stages all over the world – across small to mid and enterprise level. We power more than 25 billion of the world’s best customer experiences each year. Innovation — Genesys has a long history of innovation and leadership in the customer experience and customer engagement market as demonstrated by recognition by industry analysts, including Gartner and Forrester. In addition, the company has over 1,000 patents. Stability – Genesys is a leading software company: we have experienced substantial growth in recent years as an independent company, with 40+ percent growth attributable to organic progress and through acquisitions. Breadth (and depth) – Our deep capabilities extend to customer engagement, employee engagement and business optimization, and we are the only company that provides purpose-built solutions to all segments of the market, small and large, simple to complex, cloud and on-premises, anywhere in the world. Approx. number of UK customers using the product: We have more than 10,000 customers worldwide. Hundreds are UK contact centres. More customer success stories can be found here. Typical price for a 100 agent solution: Our pricing is dependent on the offering chosen. As an example, pricing for the PureCloud offering is published online. Pricing for other offerings ranges dependent on a variety of factors including the needs of the customer. Brief overview of product: injixo is an award-winning true cloud workforce management application for contact centres of all sizes. The feature-rich WFM suite helps contact centres optimise their entire workforce management process and covers everything they need from forecasting and scheduling to intraday management and reporting and agent engagement. injixo comes with an unbeatable and simple pricing model – £9/user/month, including free onboarding and excellent customer support. What are the Unique Selling Points of the product? injixo is feature-rich, true-cloud WFM software that empowers contact centres to facilitate and automate their entire workforce management process. This allows our clients to spend less time and effort on manual planning and scheduling – instead they can focus on what really matters: their employees and customers. With the all-new fully-automatic injixo Forecast, our clients are able to save up to 75% of the spent on forecasting (contact volumes and average handling times). injixo Forecast uses self-learning algorithms and is always up-to-date, 24/7, 365 days per year to provide you with the best possible forecast for calls, chat, email and more. injixo is a true cloud application. There is no need for a capex budget, no need for a heavy IT project, no servers to buy and maintain. There is no annual big-bang update – new features are available to every customer as soon as they are released. In addition, we provide comprehensive onboarding support – you can log in within hours of signup and then experience a setup process that has been refined and proven over 300 installations worldwide. injixo is Software-as-a-Service and costs just £9/user/month with no setup fee. injixo is monthly pay-as- you-go – you pay for just what you use and can exit anytime. The functionality is more than comparable with the expensive big-ticket vendors. Brief overview of product: Bringing together an omni-channel contact centre solution with AI and CRM in a unified Agent Desktop, intelligentContact provides a transformational way of managing calls, email, chat, social and self-service in a single ‘intelligent’ agent application. The platform incorporates all the ingredients of the traditional contact centre as standard, including an ACD with skills based routing and queuing, plus IVR, call recording and workforce optimisation. In addition, intelligentContact delivers a unified desktop, pulling together customer data from disparate sources and enterprise systems into a ‘simple, single’ agent view. This agent application delivers the CRM functionality relevant for the customer service agents whilst guiding agents through complex requests and processes. Furthermore, it enables businesses to connect with customers on any channel. The extensive case management capability enables follow up to be managed whilst a flexible business rules engine enables users to set up complex workflows and automate business processes. Available as both a premise and a cloud solution, intelligentContact has enabled our customers to transform agent productivity and ensure a fully joined up cross-channel experience. What are the Unique Selling Points of the product? IFS-mplsystems’ unique “mashup” CRM Agent Desktops are configured to make ‘complex customer service simple’, bringing together CRM, contact centre channels and enterprise-wide customer data in a simple intuitive application. In contrast to a traditional CRM approach, the objective is not to replace existing enterprise systems, but rather to present all relevant customer data from them on a ‘single unified desktop’. The desktop guides agents through complex transactions whilst intelligently presenting only the relevant data at the appropriate point in the transaction, rather than bombarding the agents with irrelevant data, tabs and menus, as is common in a traditional CRM. 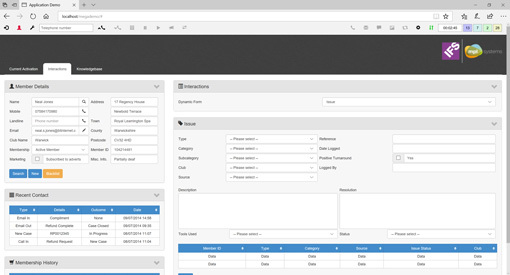 The result is a simple, intuitive agent desktop, ‘fit for purpose’ for the contact centre. What makes IFS-mplsystems really unique is the ability to configure these process centric integrated applications in a matter of weeks, as opposed to the months or years that is typical of alternative solutions which involve expensive customisation and integration. The result is a customer service desktop which will slash the time an agent spends searching for data, knowledge and processing requests, whilst empowering front office staff to do more and deliver truly transformed customer experience. For over 5 years IFS-mplsystems has led the way in the use Artificial Intelligence within customer service to identify, respond to and process front and back office requests. Whether the customer is calling, using chat, email, social media or the website, intelligentContact will respond to a wide variety of questions automatically and ensure automated processing of tasks such as account changes, refunds, password resets, distributing brochures, debt collections. This functionality can be delivered as a chatbot, virtual assistant or can be embedded in existing channels such as calls, email and social media to reduce the burden on the contact centre and filter out simple volume requests for automated processing. The solution provides seamless handoff to a customer service agent, should the interaction become complex. Typical customers: IFS-mplsystems works with clients across Europe in many industries including retail, financial services, manufacturing, services, utilities and leisure industries. This includes major brands such as Aviva, HomeServe, Iceland, Purple Bricks and Car Shop as well as B2B engineering and service companies such as Gamestec, The Metric Group, Engie and Babcock International. We specialise in making ‘Complex Service Simple’ and can deliver a unique transformational solution where businesses are struggling with the complexity of their contact centre and service operations. Typical price for a 100 agent solution: Prices start from £40 per agent per month for call centre functionality, up to £120 for full omni-channel and advanced CRM Unified Agent Desktop applications. 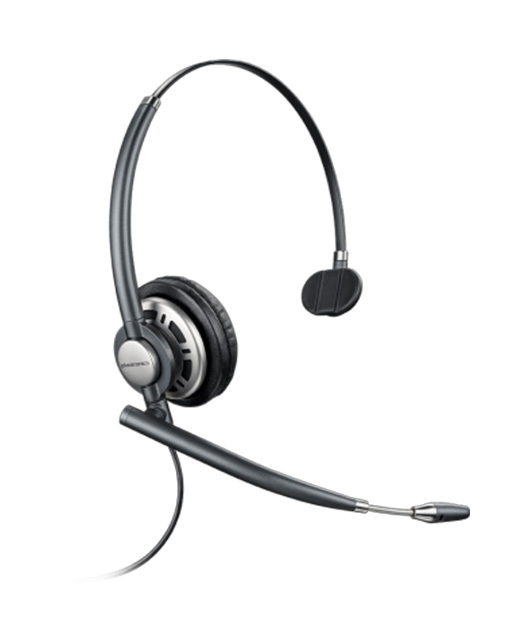 Even the basic voice price includes full CTI, IVR & Voice recording as standard features. Brief overview of product: Monet WFM is an affordable and easy-to-use cloud-based contact centre workforce management solution that includes forecasting, employee scheduling, real-time agent adherence, intra-day management, agent/supervisor collaboration, performance analytics and easy integration with over 50 telephony platforms. Contact centres will start improving service levels and reducing centre costs without the upfront expenses and IT requirements of traditional workforce management software or the limitations of scheduling spreadsheets. What are the Unique Selling Points of the product? Monet Software is a true multi-tenant cloud and best of breed WFM solution. Workforce Management is our core competence, and our SaaS solution reduces the cost and risk associated with implementing traditional premise-based WFM software and provides a secure and scalable solution with a low IT footprint. Our solution offers out-of-the-box integrations with over 50 cloud and on-premise Automatic Call Distributors (ACD). Our customers have the freedom to choose the ACD system that is best for them, without changing the WFM solution that is already in place. Also, Monet Software provides enhanced training & support to its customers. We see our customers as partners, and each of our customers receives a dedicated Customer Success Manager from the start. Our success is our customer’s success. All of your ongoing support, updates, and maintenance are included in the subscription fee resulting in a much lower total cost of ownership. Typical customers: Insurance, healthcare, retail, utilities, outsourcing, etc. Brief overview of product: Nexidia Analytics provides a hosted, managed program that ingests data from all interaction channels (voice, text, chat, e-mail, surveys, and more) and makes 100% of the data available for analysis. With its Neural Phonetic Speech Analytics™ engine, Data Exchange Framework, and Search Grid technology, Nexidia taps into the treasure trove of customer data with unmatched speed. Insights gained from Nexidia Analytics helps businesses deliver a best in class customer experience. What are the Unique Selling Points of the product? Complete customer sentiment analysis – Nexidia Analytics’ sentiment model uses words and phrases, pitch, tone, cross-talk, and laughter to measure sentiment on 100% of interactions. Flexibility – NICE Nexidia ensures results from analytics are available for any type of downstream analysis. Hosting – NICE Nexidia’s private cloud is fully PCI compliant for data privacy and protection. Low total cost of ownership – Efficiencies in neural processing provide a greatly reduced hardware footprint. Managed Analytic Services – NICE Nexidia’s Managed Analytic Services leverage experience and knowledge to ensure fast and reliable outcomes. Multichannel – Nexidia Analytics provides the most comprehensive view of customer interactions no matter what channel. Outcomes based – NICE Nexidia partners with customers and focuses on business outcomes rather than software inputs. Robust enterprise reporting – Nexidia Analytics’ reporting and analysis features deliver the business intelligence capabilities the business needs to support the monitoring, reporting, and analytical needs of every user across any organization. Scalability – Nexidia Analytics is over 50 times more scalable than alternatives. Speed and accuracy – NICE Nexidia’s deep learning neural networks give unparalleled speed and accuracy. Unbounded search – Nexidia Analytics allows for unlimited categories and reprocessing. Brief overview of product: NICE Compliance Center ensures ‘compliance by design’ by bringing together proactive compliance assurance capabilities and dedicated policy and retention management under a single umbrella. A unique solution for contact centres that enables IT, Compliance and Agents to ensure their compliance level is always optimal. The Compliance Center offers special solutions to cover the increasing number of new and updated regulations, including the upcoming GDPR. What are the Unique Selling Points of the product? The Compliance Center is unique in its offering of a dedicated solution for all the contact centre’s compliance needs. 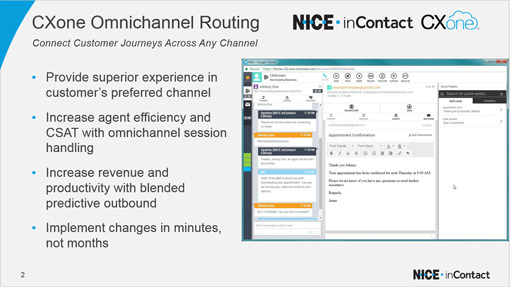 Powered by AIR & Engage, NICE’s market leading recording solution, the Compliance Center is a true omnichannel solution ready to record any channel: voice, screen, video, chat, text, etc. It has market leading real time capabilities, with the lowest latency in the market, allowing for some of the most innovative real time applications, such as Real Time Authentication. The Compliance Center easily adapts to unique requirements, to satisfy regulations across industries: whether financial, health, security or insurance. It helps you adhere to any requirements – from pause and resume recording, to tracking data, or obtaining alerts on recording. Our flexibility extends to operational set ups as we support virtually any telephony vendor and network environment, as well as all types of organizational structures including multiple sites, branch offices, and remote employees. The complexity and resiliency of our solution, the cost savings it produces (due to the magnitude of our servers, which can support over 2000 channels each), our open API and ability to integrate with other solutions, leveraging analytics, is what sets us apart. Our special offerings protect organizations from the multitude of regulations they need to comply with. Taking the upcoming GDPR as an example, through compliance APIs and by means of advanced data tagging, interactions belonging to a certain data subject across all channels can easily be retrieved upon demand, within a few clicks. This makes the Right to Be Forgotten, the Right to Data Portability, and all the other rights that necessitate associating interactions with data subjects – simple to adhere to. 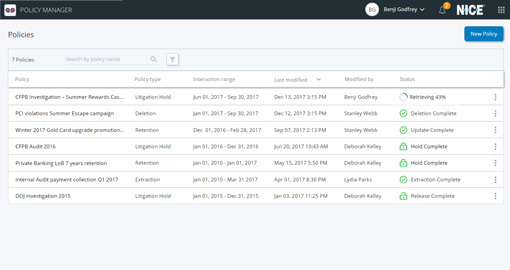 With the Compliance Center, organizations can define policies allowing them to instantaneously delete and collect requested data automatically. Approx. number of UK customers using the product: We already serve more than 400 contact centres with our different compliance solutions in EMEA and more than 2500 globally. Typical customers: Customers are across ALL verticals, cannot disclose customer names. Examples include leading financial institutions – banks, insurance firms; as well as major energy providers and not-for-profits. 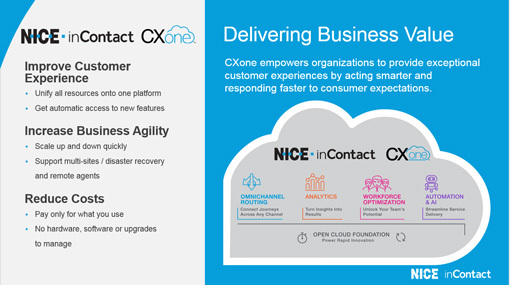 Brief overview of product: NICE inContact CXone, the world’s #1 cloud customer experience platform, helps organizations be first in their industry by powering exceptional experiences for customers and employees. CXone is the first and only platform unifying best-in-class Omnichannel Routing, Analytics, Workforce Optimization, Automation and Artificial Intelligence –all built on an Open Cloud Foundation. Only CXone delivers one unified experience, on one cloud native platform, along one proven path, from one leader. The cloud platform provides enterprise scaling, coupled with the highest levels of data security, global coverage and disaster recovery protection as well as a lower total cost of ownership as proven in an independent study with Forrester Research, http://get.niceincontact.com/Forrester-TEI-Report.html. NICE inContact empowers organizations of all sizes to provide exceptional customer experience with the most advanced capabilities available today in a true unified cloud platform with over 250,000 agents operating in over 100 countries. In 2017, over 550 companies across all industries, including large enterprise contact centres from Fortune 100 companies, migrated to our cloud solution. NICE inContact has been recognized as a market leader by five industry analyst firms (more than any other provider) including Gartner, Ovum, Frost and Sullivan, Ovum and DMG. 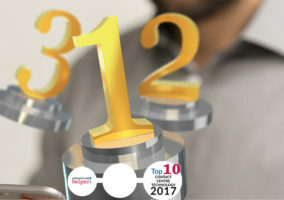 NICE and NICE inContact have both been placed in the leader quadrant in 2018 Gartner Workforce Engagement Management (WEM) Magic Quadrant and 2017 Gartner Cloud Contact Centre as a Service (CCaaS) Magic Quadrant. 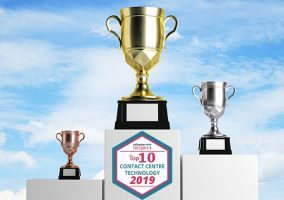 Customers who select NICE inContact CXone are looking for a robust contact centre that brings together all the components they need to deliver world-class customer and employee experiences. Only CXone provides a single, unified cloud platform with Omnichannel Routing, Workforce Optimization, Analytics and Automation and Artificial Intelligence on one enterprise-grade solution. By choosing NICE inContact CXone, customers benefit from an end-to-end offering that allows them to reliably move to the cloud via proven, enterprise class software. The added advantage of agility ensures customers can adapt, enhance or change the capacity of resources when required. The cloud platform provides enterprise scaling, coupled with the highest levels of data security, global coverage and disaster recovery protection as well as a lower total cost of ownership. Approx. number of UK customers using the product: Many of our customers are multinational firms with operations in the UK and other countries. Estimated customers with operations in the UK is over 100 with estimated agents over 2,000. Typical customers: Below are two case studies for current NICE inContact CXone customers operating in the UK. LanguageLine Solutions provides innovative language access services including high quality phone, video, and onsite interpreting with over 32 million interactions a year in more than 240 languages. LanguageLine has operations in the US and UK plus 4 other international centres as well as remote agents in 20 different countries including Austria, Belgium, France, Germany, Greece, Italy, Netherlands and Portugal. Carlson Rezidor Hotel Group has an expanding portfolio of more than 1,440 hotels and a global footprint covering 115 countries. Contact centre operations are located in US and Ireland plus 2 other global locations. Typical price for a 100 agent solution: Specific pricing details not published. Customers are billed monthly for their actual usage. We offer per agent per month pricing with options for named or concurrent agents, based on a monthly maximums or peak usage (measured in 15-minute increments). Bundles are available with single user pricing and preset packages that contain a combination of Omnichannel Routing and/or Workforce Optimization including ACD/IVR, email, chat, call recording, 1 or more ports, IP voice and softphone. Some packages include inbound/outbound minutes or outbound dialer. Brief overview of product: The Noble Enterprise Contact Centre Solution is tailored to meet each client’s unique business needs. Noble offers a unified suite of inbound, outbound and blended omnichannel communications, strategy planning and resource management tools for companies of all sizes, from enterprise organisations to small and mid-sized businesses. Our Premise, Cloud and innovative premise/cloud hybrid platforms include ACD, predictive dialling, blended omnichannel processing, compliance, recording and monitoring, IVR, messaging, interaction analytics, campaign strategy and decisioning, compliance and workforce management. Offering a Single, Unified Platform and Long-Term Stability – Our founder is still our CEO and Noble Systems has not undergone changes of ownership. Our components for inbound and outbound management, digital recording, universal queue, IVR, text-to-speech, WFM and analytics are integrated to work in a single, unified platform. Noble provides the most complete and robust contact centre portfolio of solutions designed to continuously measure, improve and align operational performance with the customer experience to increase customer loyalty and reduce cost of operations. Noble Systems is the #1 market leader for outbound technology (Frost & Sullivan – 2017, 2016, 2015, 2014 and 2013). Delivering Flexible Platforms Tailored to Client Needs – Noble Systems has developed our solution so that our clients may use our product as a turn-key solution or as a point solution to integrate into their existing enterprise systems. We offer a variety of deployment options, including local and distributed environments, as well as single-code Premise, Cloud and Hybrid platforms, so that users don’t sacrifice features or performance regardless of which model they choose. The open design of our solutions allows integration with external applications to improve efficiencies and deliver a unified environment. With our ‘building block’ approach and scalability, companies can right-size their Noble platforms to fit their needs and to support their growth. We deliver on our promise and as a result have been growing from positive word of mouth for over 28 years. Software Upgrades at No Charge – Noble Systems includes software upgrades at no additional cost as part of our standard maintenance fees. Providing Top-Quality Client Support – No product stands alone, and support is a critical requirement for mission critical enterprise applications like a call centre solution. The Noble CARE support team is based in Manchester, in the same building as our training, engineering, sales and service organisation. Our clients have access to a team with over 500 man-years of experience in the call centre business, as well as in Noble products – rather than sourcing our support to outside groups who are required to learn and understand multiple products built by different development organisations. Approx. number of UK customers using the product: In the UK, Noble solutions are used by approximately 200 contact centres, with over 10,000 agents. Typical price for a 100 agent solution: Noble Enterprise Premise Solution starts from £150,000 for a 100 seat solution. Brief overview of product: NewVoiceMedia’s cloud contact centre and inside sales technology enables businesses worldwide to create exceptional, emotive customer experiences to serve better and sell more. The only truly global platform that addresses requirements for both sales and service teams, NVM Platform enables organisations to personalise every conversation they have with their customers and prospects, irrespective of channel, by connecting customer insight and agent performance on a single, global communications platform. With a true cloud environment and proven 99.999% platform availability, NVM ensures complete flexibility, scalability and reliability. NewVoiceMedia integrates seamlessly with Salesforce, the world’s fastest-growing CRM software, and is the highest rated partner on the Salesforce AppExchange, scoring a perfect 5 out of 5 rating from more than 300 users worldwide. In late 2017, NewVoiceMedia was positioned as a ‘Leader’ in Gartner’s Magic Quadrant for Contact Centre as a Service, Western Europe. NVM platform is a multi-award-winning true cloud solution with the strongest Salesforce CTI integration on the market. With this seamless integration at the very heart of NewVoiceMedia’s cloud contact centre technology, businesses benefit from unrivalled access to their rich customer data, from every channel. Dynamic call routing, intelligent IVR and omni-channel capabilities mean customers reach the most appropriate advisor, who can resolve issues first time, smooth tricky conversations and add insight to everyday queries, creating personalised customer experiences that set you apart. NewVoiceMedia’s global call routing architecture has raised the bar on call quality for organisations running contact centres in multiple geographies. Using a single call plan in their NVM platform to control their global contact centre assets, businesses can configure and manage their global call centre more effectively through a single central touch point. This allows better management of peak periods and agent shift changes in individual regions as the intelligent overflow capability automatically routes calls to centres with spare capacity, no matter what their location. Contact centres will be able to deliver a superior customer experience, with better visibility of agent productivity and centralised management reporting. NVM’s speech analytics solution, Conversation Analyzer, optimises its customers’ contact centre management and operations, enabling them to efficiently deliver a more personal customer experience. By using NVM with Conversation Analyzer, businesses benefit from a unified, pre-integrated platform that offers valuable insights into the data captured during customer interactions. Businesses can integrate off-platform workforce management tools with NVM Platform and take positive steps towards balancing the dilemma of needing to minimise operational costs while maximising service levels. By using contact centre statistics, WFM solutions improve the accuracy of the business’s contact demand forecasts and create staffing schedules that ensure agents with the right skills are available at the right time. Furthermore, service levels are optimised as everyday use is simple and the upfront costs and burden on IT resources associated with traditional technology are removed. Approx. number of UK customers using the product: Over 300 businesses in the UK. Typical customers: Canadian Cancer Society, Ebury, FCR Media, FlixBus, JustGiving, Kingston University, Lumesse, Paysafe, Siemens and Vax. Brief overview of product: rostrvm software is a flexible, scalable and reliable contact centre solution, which can be hosted on-site, in the cloud or as a hybrid deployment. It overlays existing systems, is easy to use and enables successful, integrated multichannel contact inbound and outbound. Phone, email, text, chat, social … rostrvm integrates all channels. This prevents staff making errors because they’re not having to switch between piecemeal apps and it also provides customers with a seamless, faster service. In 2017 Rostrvm Solutions was recognised for working in partnership with Midland Heart, which won the ‘Most Innovative Housing IT System’ category in the Housing Innovation awards. The prestigious award was for its proactive solution to address the impact of Universal Credit – it introduced the rostrvm for Housing dialler and text system, with a 300% rise in proactive customer contact since project launch. What are the Unique Selling Points of the product? Designed and developed in the UK, rostrvm is a trusted multichannel solution, which can be tailor-made or used straight out of the box. As it overlays existing systems it saves both time and money. Contact centres appreciate both the expertise and knowledge of the Rostrvm Solutions team and rostrvm’s flexibility, which allows them to scale up or down, test business ideas and achieve their goals. The award-winning, intuitive communications platform enables contact centres to support customers and prospects effectively. rostrvm integrates with CRM software, including Salesforce and MS Dynamics, and its Desktop Optimisation tools streamline systems and provide faster access to apps. This enables a fast, joined-up, personal response to customer contact. rostrvm’s Intelligent Interactive Voice Response with flexible menu options decreases waiting times and provides contacts with choices, such as selecting a call back or to self-serve. Web call back is also available. Intelligent contact routing using the relevant data ensures a better, personal approach and screen pops with scripts and call logging are automated, saving time and improving levels of staff and customer confidence and satisfaction. rostrvm Outbound Precision dialling helps contact centres solve business challenges such as call volume to staffing ratios and enables them to reach contacts at the right time with the right message. Easy to read real-time and historical performance metrics ensure informed decisions can be made on any required adjustments in service, including channel shift and blending. This optimises productivity and enables higher standards of customer service to be achieved. rostrvm is compliant and secure, and offers call and screen recording for quality and training purposes. Another key benefit of rostrvm cited by customers is that Rostrvm Solutions is based in the UK and so can provide fast, dedicated support – it’s never far away and is not affected by global structuring and events in the same way larger international companies are. It has unrivalled technical expertise to provide innovative and robust contact centre solutions that can evolve as business needs change. Typical customers: Wasps and Ricoh Arena, BH Live, Midland Heart, Kirklees Neighbourhood Housing, Dudley Metropolitan Borough Council, Anglian Home Improvements, Bedford Insurance, Bouygues Energies & Services, XLN Telecom, Hertfordshire Partnership NHS Foundation Trust. Brief overview of product: Sabio’s 20+ years of pedigree, expertise and experience is at the heart of our “reference architecture” Contact Centre as a Service (CCaaS). A private voice platform, available in “Hosted” or “Hybrid” models. Our Hosted model is available from Sabio’s own data centres and is available with advanced service and operational assurance technology such as, Performance Testing, PCI Compliance, Voice Analytics, Proactive and Predictive Contact Centre Monitoring, Voice Quality Monitoring and Recording Assurance (specifically applicable to call recording in the financial sector and all other customers who care deeply about CX). The Hosted model includes a technical managed service, whilst still allowing the customer access to perform “business for business today” changes such as user admin or operational adjustments. Option A: Deployed in the customers datacentre, Sabio providing the underpinning infrastructure. Option B: Deployed in the customers datacentre, the customer providing the underpinning infrastructure. Monitoring as a Service (MaaS) – Enterprise contact centre 24×7 proactive and predictive monitoring. Including automated system and operational daily checks, advanced uptime management, capacity management (including licence utilisation) and event management. MaaS ensures system performance, highlights risks to service, captures metrics and trends system data for informed platform management and housekeeping. MaaS is also providing a level of automation which on average is saving the customer over 10 hours of effort per week. 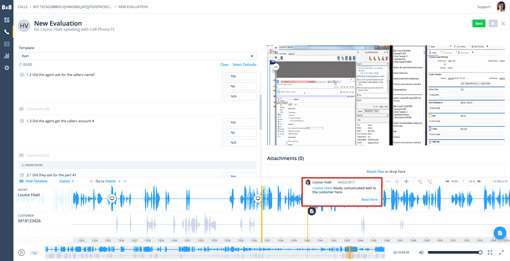 Voice Quality Monitoring as a Service (VQMaaS) – Monitors the quality of voice within the network from the agents handsets all the way across local and wide area networks (even if provisioned by the customer). Provides early notification to Sabio’s global support centre of potential service degradation affecting the agent/customer interaction/journey. 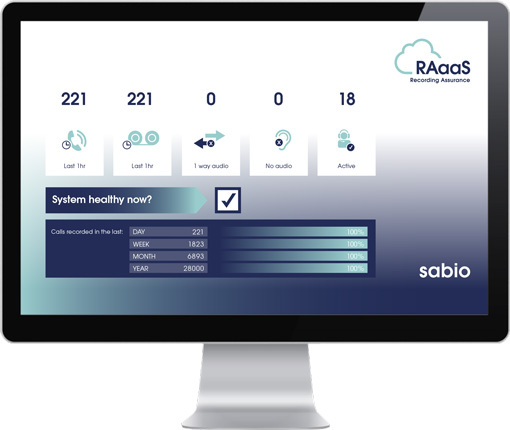 Early notification and trending of issues allows Sabio to proactively identify the root cause of common network issues before they become a significant problem. VQMaaS is proven to reduce the MTTR (Mean Time To Resolution) of agent call quality issues by up to 30%. 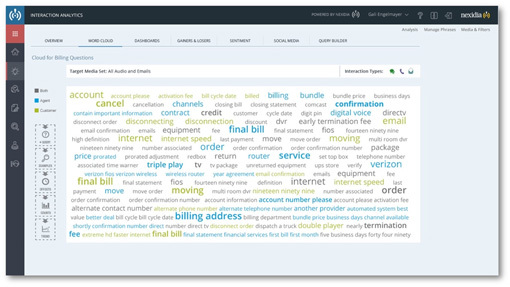 Rapport Voice analytics – A trend-based Dashboard solution enabling clients to uncover a multitude of caller insights including the reasons and times of call failures, repeat call levels, the cost of Failure Demand and a unique Customer Effort scoring system. Rapport’s solution captures up to 20% more caller journeys than typically measured at call centres and because it requires no IT integration, it’s very simple to deploy. Performance Testing as a Service (PTaaS) – Provides the customer the opportunity to complete pre/post change testing to validate change success. Alternatively, Performance Testing can be used to assess the platforms ability to scale; in preparation for a major event such as Black Friday for example. This service provides confidence to the business operations to proceed with major campaigns. Recording Assurance as a Service (RAaaS) – Available as a “switch on feature” providing CX and MiFID focused firms with insight, assurance and peace of mind that the completeness, accuracy and performance of call recording is where it should be. RAaaS informs customers proactively to any issues relating to the successful capture of call recordings. As an example, this could be a single failed recording or even as comprehensive as a recording which appears to be successful, but does not match the length of the actual call held between the agent and the customer. Important information, assurance and analytical data is presented to the contact centre operations via a browser based initiative dashboard. A simple glance will provide insight into the health and performance of the call recording services ensuring compliance with the appropriate regulatory requirements. SuperChannel – Available as a “switch on feature” providing the ability for the contact centre to provide a co-browse facility to the customer. During a customer interaction, SuperChannel enables either the customer or the agent to share visual information. A text message/url is shared with the customer which launches the co-browse session. During the session, either party can share all types of information and data such as photo, document, website content or even a GPS position. A use case example could be for the validation of ID documentation such as a passport or driver’s license or to provide evidence of car damage during an insurance claim. Through SuperChannel we are seeing a 7% increase in FCR and a 3.6% reduction in AHT. PCI – Delivered as a “switch on feature” as a cloud based service enabling agents to take payments without ever seeing, hearing or touching sensitive customer data. No customer data ever reaches the customers infrastructure. Brief overview of product: Scorebuddy is Quality Monitoring Software that was purpose built for Call Centre/QA Managers rely on to improve the quality of their customer interactions in a controlled & consistent way. The Scorecard Builder enables quality managers to easily build scorecards. Off the shelf reporting as well as deep dive analytics take the pain out of the quality monitoring process. The Surveys module enables quality managers to put internal quality scores beside external customer sentiment for a 3600 view of their service. There are dashboards for both agents & supervisors to communicate improving agent engagement. If you are using spreadsheets for quality monitoring Scorebuddy was built for you. If you are looking to improve your Customer Experience Scorebuddy will help you to do that in a controlled and consistent way. Typical customers: Scorebuddy customers are many and varied, from Airbnb to IKEA, from Government departments to charities like WWF, to financial institutions like Capital One and Allianz. Brief overview of product: This solution provides for the forecasting, scheduling and intraday management of contact centre and back office employees. What are the Unique Selling Points of the product? Only WFM suite with 46 algorithms for forecasting to achieve the most accurate estimate of people needed by interval. Only WFM suite with the ability to simulate the exact routing rules and allocation of skill / skill levels of any ACD. This simulation corrects the inherent over staffing situation that normally occurs when forecasting in skills based routing environment. Only WFM suite with the largest number of options for agent preferences and business rules to ensure work/life balance, compliance with UK labour laws and enforcement of business constraints. Only WFM suite with different scheduling methods including availability points where the company assigns each agent a point quota, assigns points to shifts, then allows agents to select which shifts meet the quota while maximizing their utility. 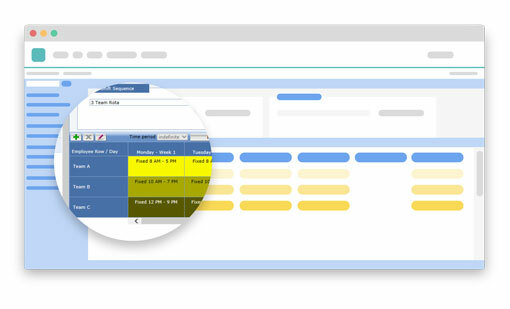 Only WFM suite with the ability to automatically solve intraday over and understaff situation by detecting the over/under situation, identifying agents to work additional hours (based on rules) or agents to self-select for voluntary time off, then contacting then by the method of agent choice and updating the schedule without any admin or supervisor actions. Only WFM suite with a robust messaging system that can tailor messages based on rules defined, such as on the third time an agent ACW exceed a predefined amount when service levels are not being hit. These messages can be tailored to the agent, supervisor or manager. Only WFM suite with a complex rules engine that solves problems that required manual intervention in the past. Only WMF suite that provides SNMP support for IT to monitor the health of the system. 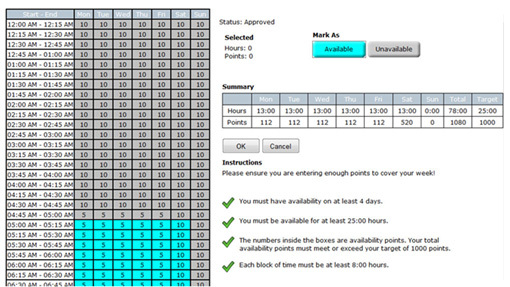 Screenshot of availability points where agents can select which time slots they want to work. 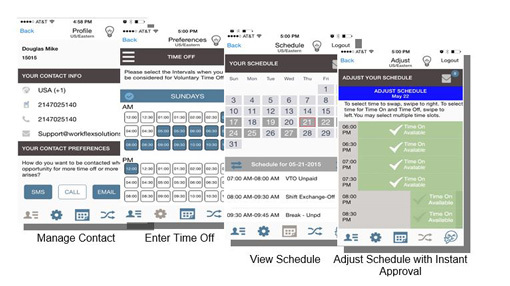 Example screenshots of interacting with the schedule via a mobile phone. Brief overview of product: ZaiLab is a next-generation software company specializing in omnichannel contact center software based in the cloud. They have created software for businesses of all sizes, particularly small to medium contact centers looking for a cost-effective way to personalize routing, improve client conversations and increase efficiency. Zailab revolutionizes the contact center industry with its unique approach that is more focused on interaction above anything else. It is a solution designed to make communications between companies and customers more rewarding and turn any engagement into a smooth, seamless, and productive experience. Powered by the software’s artificial intelligence, users can map out a smooth and unhindered contact journey for their clients. Agents have instant access to their customers’ previous calls, issues, and other essential information that can help them quickly tailor a resolution and a smooth contact experience for their clients. The software uses its own algorithms to route calls efficiently and pair caller with the most qualified agent available. Zailab doesn’t break the bank, which makes it an ideal contact center platform for small to medium-sized businesses. Users don’t have to be concerned about licensing fees and long-term contracts as Zailab utilizes a usage-based pricing model. That means users only pay for what they use, which are activities that bring more value. Set up is fairly easy. Users only need six minutes to set Zailab and then start their interaction with their clients and prospects. Ease of use is another highlight. The software is built for fast and effortless self-administration. What are the Unique Selling Points of the product? We can drastically improve the way you administer your contact center, the way routing works, and the way you pay for software. Set up your contact center in just a few minutes. Easily adapt your setup to changes in your business. ZaiLab is designed to be self-administered, so call flows and other operational factors can be changed quickly and easily, with no need for expensive professional services. Depending on the complexity of the organization, the setup can be completed in anything from mere minutes to just half a day, and any changes made to call flows are activated immediately. Do omnichannel right with a single smart-queue. Connect your clients to the right agents. For customers, waiting in queues and endless transfers between different departments can be unbelievably frustrating. With traditional contact center software, interactions are placed in queues depending on the task or channel. From there they are dealt with in a first-in, first-out fashion. The interaction is routed to a group of agents, and the first agent to react is usually the one who receives the interaction. At ZaiLab, we use a single waiting room – a central location for all incoming and outgoing interactions (phone calls, emails, SMSes, et cetera); here they are weighted, prioritized and routed to minimize frustration and maximize agent–customer compatibility. A sophisticated suite of machine-learning algorithms assesses the interactions using historical data and a host of other factors. It identifies how important each is relative to the others, as well as which agent would be the best fit for a given interaction. At the broadest level, how interactions are routed and prioritized is defined by the site, services, and skills you’ve set up, along with the SLA and business value specified for a work type. Pay only for the features your organization uses. Don’t pay any start-up costs or monthly fees. The current pricing model for SaaS contact-center solutions today is based on a per-license fee per user. A contract spanning two to three years is a common requirement. In cases where an on-premises solution is used, the capital expenditure must be taken into account as well as face-in, face-out, maintenance and upgrade costs. In addition, changing your IVR setup or creating a new interaction flow tends to be so complicated as to require expensive professional services – and all while your operation grinds to a halt. At ZaiLab, we believe that our customers should only be charged when there is business value for them. For example, if you order a taxi via an app on your smartphone, you want to pay for the ride and not for the app. Why shouldn’t this be the case with contact center software too? This is exactly why we offer a simple pay-as-you-go pricing structure. Because ours is a truly cloud-based solution, there is no need to invest in on-premise hardware, which means there is no capital outlay, no third-party cost for setting up your organization, and no upgrade costs. We also refuse to lock our customers down into contracts – you can opt out any time you like, no strings attached. Approx. number of UK customers using the product: We are launching our product for the USA and UK market in March 2018. This allows us to go live in the UK and enable UK based contact centers to use the product. We are in process of rolling out our pre-launch campaign through platforms such as Contact Centre Helper and other channels. Typical price for a 100 agent solution: Zailab uses a simple but sophisticated usage-based payment model. Every scenario differs from client to client depending on their software consumption and the features they use, basically, you are billed for what you use. We have incorporated a pricing calendar on our website for users who would like to pre-calculate their consumption cost upfront. Is call recording included or not? Does your contact center use QA or not? The number of QA minutes will be billed per second. 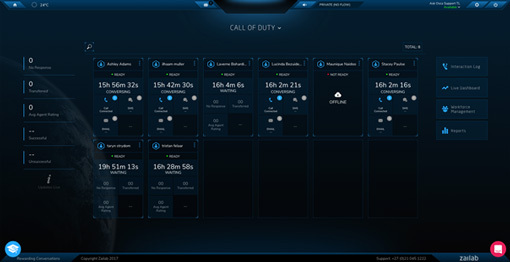 Figure 2: The team leader dashboard is used to monitor the status of agents in real time. The last awards in 2017 were won by NewVoiceMedia. In 2016 the awards were won by Scorebuddy. 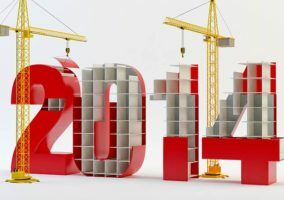 In 2014 mplsystems won. Datasquirt won in the 2011 awards and were purchased by LiveOps soon after, and RightNow Technologies won in the 2009 awards and were subsequently purchased by Oracle. Voting has now closed and the winner will be announced in late May 2018.